This home has enough space for multiple families and is equipped with all the amenities for the avid skier to relax and prepare for the next epic day on the slopes. The custom designed ski room is equipped with eight lockers and 16 cubbies, a full tuning bench, and a 24 pair boot rack. One upstairs master suite has one king bed and bath with a solid marble tub; a second has one king bed and private bathroom with two separate showers and vanity areas.A third upstairs bedroom sleeps four on two sets of bunk beds. The downstairs master bedroom has a king bed, as well as a private bathroom and attached deck. Another queen bedroom and bunk room (sleeps four) downstairs also have their own private bathrooms. Guests may park one vehicle in the garage and three directly in front of the home. Ski to the front door of this luxurious custom-built home. The finest materials and rustic details are used throughout, and the house is designed to maximize natural light and showcases sweeping views of Red Cliffs. This stand alone home can accommodate multiple families and friends. 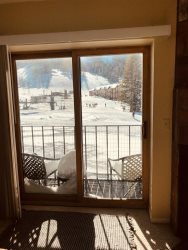 Located in the Palisades, Kirkwood's premier ski-in/ski-out neighborhood, you will enjoy easy access to skiing, dining, hiking, biking and other year-round activities. This 4,500 square foot home has all the amenities you need. The beautiful custom kitchen has granite slab countertops, 6-person island seating, custom cherry cabinets, Viking refrigerator, Thermador range and two Bosch dishwashers (second fridge available in the laundry room). The home has six bedrooms including three master suites and 5 1/2 baths. There are two bunk rooms and an additional queen bedroom as well. Kick back and barbeque (gas grill provided) on the two south facing decks. When it’s time to check in, hook up to the high speed internet with Wifi, available on all three floors. This home is also equipped with top of the line audio and video equipment, including two flat screen TVs, each with surround sound, built in sub-woofers, DVR, iPod docks and Blueray DVD players. Radiant heat and individual thermostats ensure all of your guests are comfy and cozy when it’s time to turn in for the night. Check-In begins at 4:00PM and Check-Out is by 11:00AM. Any early/late check in/out is 1/2 day rent minimum.